Leaders from different religions will be at vigils today outside Labor offices, including leader Bill Shorten. 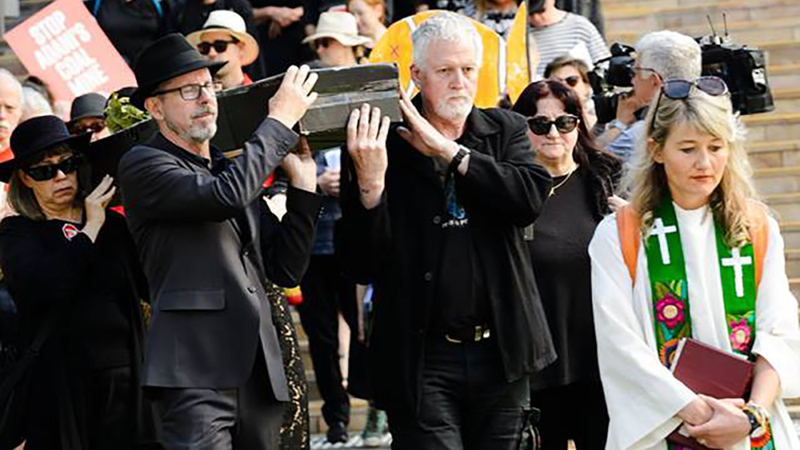 Religious leaders are banding together today to hold “Funeral for Coal” vigils outside the offices of Labor leader Bill Shorten in Melbourne and Shadow Environment Minister Tony Burke in Sydney. Between 10am and midday, the vigils are being staged by interfaith organisation, the Australian Religious Response to Climate Change (ARRCC). It aims to persuade Labor to block the Adani coal mine planned for Carmichael in the Galilee Basin in central Queensland. A smaller Funeral for Coal was held yesterday outside the office of Shadow Treasurer Chris Bowen in western Sydney, attended by around 18 people, who prayed and meditated during the vigil. “It was really quite sombre. This is serious – this is a potential catastrophe that we need to avert together. We are calling for God’s help,” Ormerod explains. The ARRCC targeted Bowen because of comments he made in February that Labor would not block the mine if it wins the federal election. The group is also calling on people to write a letter to their local Labor MP or candidate to express their concern about Bowen’s stance. In expressing their concern about the impact of the Carmichael mine on global warming, the ARRCC is also campaigning to prevent any other new coal mines in Australia. “Adani is a rather important case in point because once that opens up and the rail and road associated with that mine, there are seven other companies wanting to start exploiting the Galilee basin. And the Galilee basin has six per cent of the whole entire world’s carbon budget … It’s just something that the world can’t afford … Nationally, we’re acting very selfishly,” argues Ormerod. “Humanity is pushing the atmosphere to the brink … [and] we are getting plenty of warning signs. The ARRCC protests coincide with Adani being fined more than $13,000 for polluting wetlands from its Abbot Point coal terminal in Queensland. They also come at the same time as reports that Adani is ready to commence mining at Carmichael as soon as it receives government approval. And she believes that as an interfaith organisation, the ARRCC plays a pivotal role in shaping the climate debate. “It’s amazingly easy to get agreement across all the different religious traditions. We’re not pushing religion, we’re pushing a better world – a world that’s more respectful and sustainable and fair towards people.